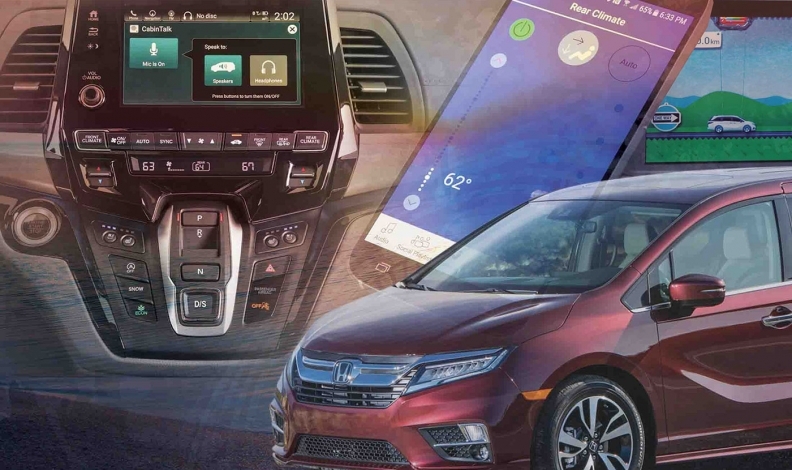 The new Odyssey has a host of advanced features, including CabinControl, a mobile app that lets passengers adjust climate and entertainment settings. WAIKALOA, Hawaii -- If a central challenge of autonomous vehicles is easing the tedium of driving without lulling the driver to sleep, it's the same challenge facing the developers of the modern minivan. 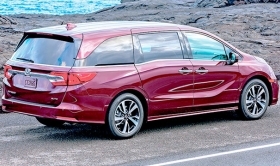 The technology on board models such as the Chrysler Pacifica and Honda Odyssey can create what seems like a parent's dream: a silent cabin free of disruptions, with each passenger tuned into tablets or wearing wireless headphones, blissfully unaware of the non-Pixar landscape passing outside the windows. Rear-seat navigation apps such as Chrysler's "Are We There Yet?" and Honda's "How Much Farther?" give the kids one less thing to nag parents about. There's hardly a reason for anyone to say a word. That's not necessarily a good thing, says Jay Joseph, American Honda's assistant vice president for product planning. In the context of driver distraction, "you think all stimulus is bad," Joseph told Automotive News during a media introduction for the 2018 Odyssey here. "And that's actually not the case." Joseph, an engineer who spent more than a decade working in Honda's safety and regulatory offices, cites a psychological principle called the Yerkes-Dodson law, which holds that overstimulation can diminish a person's performance at a given task, but that understimulation -- such as a silent cabin free of chatter -- can have the same effect. "Even though we talk about driver distraction, there's actually a need to engage the driver in the act of driving and in the vehicle environment," said Joseph. "So we look at it from that perspective. You have to provide enough stimulus to keep the driver alert and engaged, but not so much that you overstimulate and distract." The Odyssey has extra noise-deadening material under the floor and in the engine compartment. That's the thinking guiding some of the 2018 Odyssey's technology offerings, which aim to cut down on more nettlesome distractions but still preserve a sense of community among the minivan's occupants rather than isolating them in their own cocoons. "We want family connection within the vehicle," says Joseph. "We don't want isolation or separation." Take, for instance, CabinTalk, a sort of public-address system that allows the driver to speak -- without having to shout repeatedly -- to the rear passengers, either via the rear speakers or through the wireless headphones that come with the Odyssey's rear entertainment system. It's activated with a button on the touch screen. Joseph said one of the ideas behind CabinTalk is "being able to simulate communication even when it's difficult," such as when the rear passengers are tuned into a movie and tuned out of everything else. "All the minivans have big headphones," says Chad Harrison, chief engineer for the 2018 model. "The kids are engrossed. Can't get their attention at all. [You're] snapping, whatever." With CabinTalk, he says, "push the button and say, 'Hey, what do you want from the drive-through?' "
Honda's CabinControl smartphone app is another example. Rather than the Bluetooth connection used to sync the driver's phone, CabinControl works over the Odyssey's on-board 4G LTE Wi-Fi network to let rear-seat passengers who can't reach all the buttons use their smartphones to control their HVAC and entertainment options, without troubling the driver. But passengers can also use the app to queue up their choice of songs for all to hear, or send proposed destinations to the navigation system; parents can accept the suggested stop at the Dairy Queen just off Exit 47A, or decline it. The driver stays engaged in driving, says Joseph, "but connected to everyone else." It's not just tech features. The Odyssey incorporates extra noise-deadening materials under the floor and in the engine compartment to foster what it calls "old-fashioned family connectivity." An expanded third-row window offers teens in the way-back more of the outdoors to see and talk about. "It is noticeably open back there, and not like you're looking through an airplane window," said Harrison. The Odyssey's development offers a window into the higher-stakes challenge involving self-driving vehicles, in which the "drivers" are relieved of the negative effects of overstimulation but also deprived of the engagement that they'd need to perform well if they are suddenly called upon to take control. "Keeping the potential human driver engaged when they're not involved in the act of driving, keeping them alert is a very different challenge," Joseph said. "We might actually have to provide content. We might have to provide video and monitor the driver so we know when they're ready."